Kevin Lindsey, Commissioner of the Minnesota Dept. of Human Rights, says the Minnesota Public Utilities Commission (PUC) had not done enough to respect indigenous rights in the Enbridge Line 3 tar sands pipeline debate. Lindsey wrote a letter to the PUC as part of the final comment period on the state’s environmental impact statement (EIS). At issue was whether or not the state would require a traditional cultural properties survey along the proposed pipeline route prior to signing off on the EIS. Lindsey said it was important to get the survey right before moving forward; the PUC ultimately disagreed, approving the final EIS last week. Refusing to recognize Tribal nations’ rights, needs, and concerns on a project that impact their land is a detriment to all indigenous peoples, to our state, and to our democracy. Human rights are advanced when we recognized historical injustices and make changes to our systems so they do not occur again. MDHR supports a process in which Tribal nations are consulted and listened to as true partners in this complex project. Honor the Earth map of Enbridge Line 3. Enbridge Line 3 carries toxic tar sands crude oil from the mining areas of Alberta Canada, through Minnesota to Superior, Wisc. The current Line 3 is old and failing. 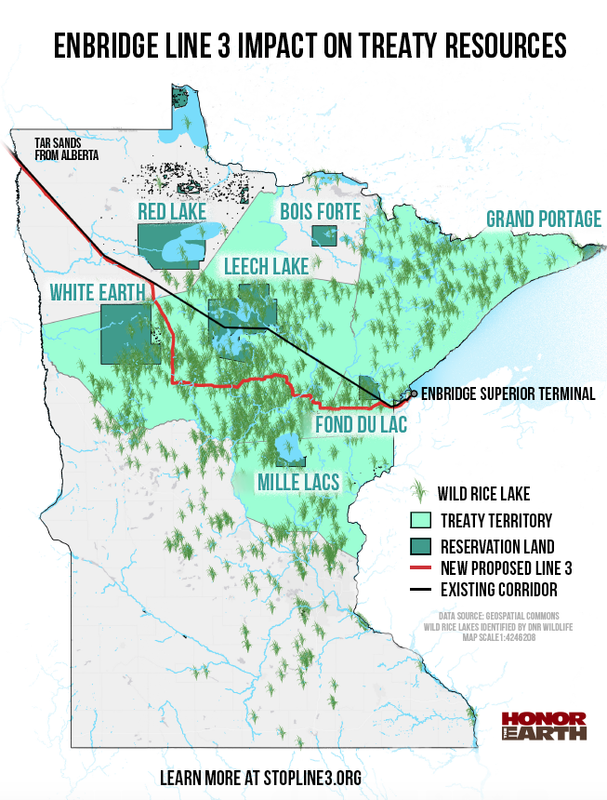 Enbridge proposes to abandon it in the ground and build a new and larger pipeline through 337 miles of northern Minnesota, cutting through forests and waterways. It would cross the Mississippi River twice and threaten wild rice areas. The proposed Line 3 route also passes through much lands where the Anishinaabe retain the rights to hunt, fish and gather. The state review process has sidestepped the treaty rights question. One concern the Anishinaabe have is that construction of the new pipeline could impact historical cultural sites. The state is moving ahead with a vote on the project this June, before the survey is complete. While the Final EIS does clarify that the survey will be completed before construction, MDHR [Minnesota Dept. of Human Rights] believes that this process insufficiently addresses Tribal rights and needs. The PUC should learn from the experience of other governmental entities of the benefits of a thorough process. Two years ago, thousands from around the world showed up at Standing Rock to protest the Dakota Access Pipeline and the impact it would have on Native people. Just last year, MnDOT’s Highway 23 project was halted after the agency damaged a Native American burial site. These projects show the impact, public outcry, and wasted resources that can occur without proper vetting of these sites. Click here for Lindsey’s letter.